Hailing back to the old comic book days, this Thors Thunderbolt T-Shirt possesses an iconic and classic design that makes it quite the accent to own and wear. The shirt is black, which helps the vibrant yellow and red graphic to really stand out. 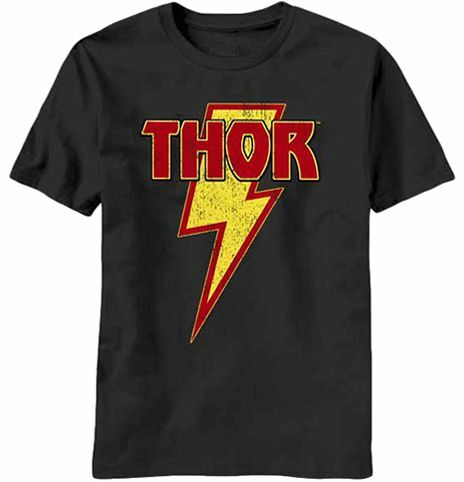 The central graphic on the shirt depicts a golden-yellow thunderbolt rimmed with red trim, set under the boldly displayed name THOR, which is done in matching colors. The shirt is crafted in quality cotton, making it a very comfortable garment to wear. Unique in its style, this Thors Thunderbolt T-Shirt allows you to bring some comic book style to your wardrobe, while also celebrating your favorite of the original Avengers.